The Legend of Zelda: Majora's Mask (ゼルダの伝説 ムジュラの仮面 Zeruda no Densetsu Mujura no Kamen) (sometimes shortened to MM) is an action-adventure video game developed by Nintendo's Entertainment Analysis and Development division for the Nintendo 64. It is the sixth installment in The Legend of Zelda series and the second using 3D graphics, the first being The Legend of Zelda: Ocarina of Time, the game's predecessor. Majora's Mask is set in Termina, a distant land from the usual series setting of Hyrule, where the Skull Kid has stolen Majora's Mask, a powerful ancient artifact. Under its influence, the Skull Kid causes the land's moon to slowly fall towards Termina, where it crashes after three days. The main protagonist Link repeatedly travels back in time to the beginning of the three days to find a way to stop the moon from destroying the planet. 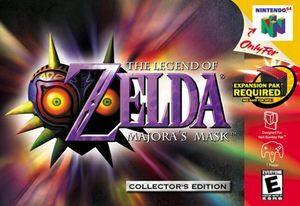 The gameplay is centered on the perpetually repeating three-day cycle and the use of various masks, some of which allow Link to transform into different beings. Link learns to play several melodies on his ocarina, which have a variety of effects like controlling the flow of time or opening passages to four temples, which house challenges Link must overcome. Unlike Ocarina of Time, Majora's Mask requires the Expansion Pak, which provides additional memory for enhanced graphics and more on-screen characters. The NTSC-U version of this game will hang after the spinning N, and there is no solution at this time. See issue 6253. Fixed by 5.0-2127. The PAL Version will crash if no save file is present. Taking a save file from the Wii and using it in Dolphin will avoid the crash; however, saving is still broken. See issue 6253. Fixed by 5.0-2127. The game crashes while writing changes back to the save file, which makes creating an in-game save impossible in the first place. It is unknown whether using a pre-made save file will work around the issue. See issue 6253. Fixed by 5.0-2127. The Widescreen Hack has issues with projection alignment that can be fixed with a Gecko Code. The graph below charts the compatibility with The Legend of Zelda: Majora's Mask since Dolphin's 2.0 release, listing revisions only where a compatibility change occurred. This page was last edited on 31 December 2017, at 04:28.